Tom Shanley was on target for new club Stockton. New Stockton signing Tom Shanley was on target in an emphatic 8-0 friendly win over Coventry Alliance Division One side Potters Green on Saturday. Shanley, who has moved to Town Piece from Premier Division side Kenilworth Wardens, completed the scoring five minutes from time. The returning Josh Cole also scored two, with captain Luke Cole, Tom Callaghan (2), Elliot Parasmo and Liam Jones completing the scoring. 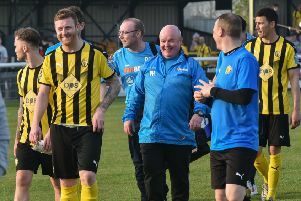 But despite two of his new faces getting on the mark and Kev Archibald impressing after also joining from Wardens, Stockton manager Scott Easterlow said retaining the bulk of last season’s promotion-winning squad was key to their chances of top-flight success. “It was a good workout by everyone in the heat,” said Easterlow, who masterminded Stockton’s march to the Division One title last season. “Twenty players were used and everybody added something to the result. “Kev (Archibald) was superb today and didn’t put a foot wrong and Shanners is a tricky customer for any defence - another two good signings for us. “We’re nearly done now and only chasing three more signatures and that will be the squad complete. “As important as the new signings are for us it’s just as important we keep the players from last year, too. Stockton entertain near-neighbours Southam United on Saturday (2pm).